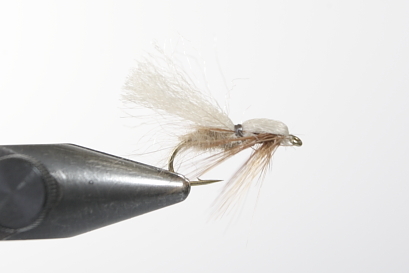 This pattern sits better in the water and either static or moving it does behave like a sedge. I even found that when it was gunged up with slime and sunk it still caught fish. I suggest you tie some up in 10s and 12s and and keep them ready in your fly box. I only wish I had some of these when I went to New Zealand earlier this year. The deer hair patterns are more complicated to tie and create a mess when you trim them up and I feel are less effective. Hackle Blue Dun/ Red Game. Trim off the all the hackle fibres projecting downwards. Body Cream dubbing ( possum under fur) tied meaty.